A new Cornell study published this month in Environmental Pollution finds that glyphosate, the active herbicidal ingredient in widely used weed killers like Roundup, was present at low levels in a variety of dog and cat foods the researchers purchased at stores. Before you go switching Fido or Fluffy’s favorite brand, however, be aware that the amounts of the herbicide found correspond to levels currently considered safe for humans. The study grew out of a larger interdisciplinary research project led by Brian Richards, senior research associate in biological and environmental engineering, and supported by the Atkinson Center for a Sustainable Future’s Academic Venture Fund, which sought to reassess glyphosate mobility and impacts in several contexts: movement from crop fields in surface water, impacts on soils and on animals consuming it in their feed. Richard’s co-investigators Anthony Hay, associate professor of microbiology, and Kenneth Simpson, professor of small-animal medicine, visited a pet store and a retail outlet, where they selected multiple bags of cat and dog foods from major brands. The 18 feeds were all mixtures of vegetable and meat ingredients, and one product was certified GMO-free. Analyses conducted by postdoctoral researcher and lead author Jiang Zhao in Hay’s lab, and research support specialist Steve Pacenka, found that all of the products contained glyphosate at concentrations ranging from approximately 80 to 2,000 micrograms of glyphosate per kilogram. Since there is not enough data available to determine what effect – if any – low-dose glyphosate exposure has on domestic animals, the researchers used human acceptable daily intake guidelines to put these findings in context, according to Hay. The researchers estimated that the median dog exposure would amount to only 0.7 percent of the U.S. glyphosate limit set for humans. “While the levels of glyphosate in pet foods surprised us, if a human ate it every day, their glyphosate exposure would still be well below the limits currently deemed safe,” Hay said. “Even the most contaminated feed they studied had thousands of times less glyphosate than levels that were shown to have no adverse effects on dogs in the U.S. EPA’s Draft Risk Assessment for glyphosate” said Dan Wixted, a pesticide educator with Cornell Cooperative Extension who was not involved in the study. While unable to pinpoint the exact product or crops that were the source of the glyphosate, Hay’s team did find a correlation with fiber, suggesting a plant-based origin. One surprising finding of the study: Glyphosate was detected in the one GMO-free product the researchers analyzed at levels higher than those of several other processed feeds. This suggests that keeping feed stocks uncontaminated is a challenge even in the GMO-free market. What is a pet owner to do with this information? Hay, for his part, has stopped feeding chow found to be high in glyphosate to his own dog, a pug beagle mix, but he hasn’t seen any changes in her health. Yesterday, I led another Cooking for Dogs workshop which is a workshop I designed about four years ago to encourage owners to add fresh ingredients into their dog’s diet. We also discuss the latest research into dog diets (such as the July 2018 announcement by the US FDA about a possible link between grain-free foods and heart disease) and what makes a ‘good’ ingredient for a recipe – things like choosing meat ingredients and the use of spices such as ginger and turmeric. I’m a supporter of the hybrid diet – where dogs are fed commercial food, raw food and also homemade food for variety and nutritional support and to mitigate the risks of long-term nutritional deficits. Look at the colors in the bowl – fresh foods like watermelon! What pig wouldn’t want to chow down on food that that was this fresh? And I’ve had a few interactions with clients this week which were also food related. For example, the well-meaning owner of a Labrador puppy. I had to tell her that I felt her dog was overweight and that she needed to reduce the amount of food being fed daily (adjusted also for treats used in training). And then there was the dog that had been losing weight and urinating in the house. I strongly advised that the dog be taken to the vet for a health check and the results were in – a pancreatic problem brought on by feeding raw. In this case, I suspect that the raw food mix being fed to this dog was way too high in fat and also contained consistently too much liver instead of a mixture of other organ meats such as heart and kidney. Regardless, the dog was not thriving on its diet and, worse, was being hurt by it. A change in diet to a commercial kibble has seen a return to health and no more urinating in the house which is a positive for both dog and owner. Every dog is different when it comes to diet. There is no one right or wrong answer, but there are tools and techniques we can use to match them to a diet that works. Clients of my practice know that I feed a hybrid diet, that is a diet that is part commercial dog food (dry food – ‘kibble’ as well as dehydrated raw food), raw (real meat) and homemade food using both real meat, vegetables, eggs and fruit. Izzy had helped herself to the donated food. It seemed she found it quite tasty. So, I decided the donated food could be hers and I would replace the bag with another one. In the meantime, I let her have one small handful with one of her meals over the next few days. And she did something she had never done before… during the night she was chewing on her feet. Really chewing. For the first night, I dismissed it as a one-off irritation. By the fourth night, I knew something was up. It was the dog food, of course! The supermarket dog food has gone into the organics bin to be recycled. I’ll make a donation to the fundraiser in lieu of another bag of that food! Lamb (source of glucosamine), brewers rice, whole grain corn, whole grain wheat, poultry by-product meal (source of glucosamine), corn gluten meal, soybean meal, animal fat preserved with mixed-tocopherols, calcium phosphate, glycerine, animal digest, calcium carbonate, potassium chloride, salt, caramel color, Vitamin E supplement, choline chloride, zinc sulfate, L-Lysine monohydrochloride, ferrous sulfate, sulfur, manganese sulfate, niacin, Vitamin A supplement, calcium pantothenate, thiamine mononitrate, copper sulfate, riboflavin supplement, Vitamin B-12 supplement, pyridoxine hydrochloride, garlic oil, folic acid, Vitamin D-3 supplement, calcium iodate, biotin, menadione sodium bisulfite complex (source of Vitamin K activity, sodium selenite. Back in January, I posted a blog about Prescription diets – what’s the truth? 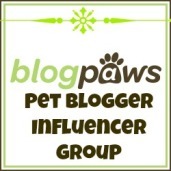 In this post, I’m again going into the controversial world of commercial dog food and sharing some information on breed-specific dog foods. The two labels most associated with breed-specific foods are Eukanuba and Royal Canin, although there are others. In the November 2016 issue of Your Dog (published by the Cummings School of Veterinary Medicine at Tufts University), veterinary nutritionist Cailin Heinze provided opinion about such foods. Although these pet foods must meet the AAFCO (Association of American Feed Control Officials) standard, ‘tweaking’ recipes to make them slightly more suitable for a particular breed isn’t a big change to make. The article points out that there are no feeding trials to support the claims made for breed-specific dog foods and that the breed-specific formulations are not therapeutic diets. You will need to buy access to read the article in its entirety (follow the link above), and I won’t break copyright by printing too much of the article in this blog. It is heartening to see a veterinary nutritionist making these comments. Too often, criticism of commercial dog foods is discounted because the writers are not veterinarians. 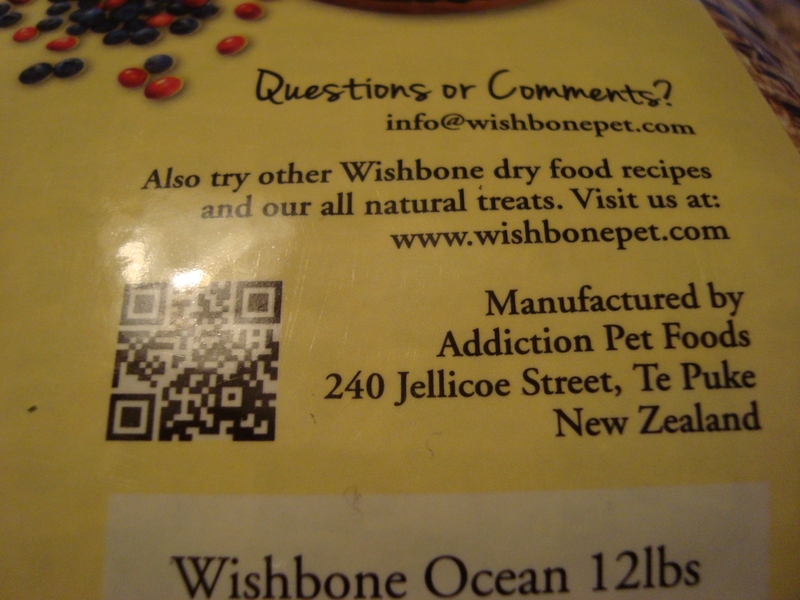 There is a lot of information on the web about reading the food ingredient label on your dog’s food. Some of the advice I agree with, some of it is purely marketing. But I have a much simpler test for you. If you feed a commercially prepared food (whether raw, cooked or processed), take a look at the label. Here’s the label on the commercial kibble that I am currently feeding Izzy (she is on a diet of home-cooked mixed with this food). It is made in New Zealand (where we live). Country of origin labeling can offer an insight into quality, particularly in terms of things like food safety, security of the supply chain, and length of time the product has been on the shelf. On 22 February 2015, Hollywood celebrities will gather for the 87th annual Academy Awards. Only a few talented individuals will walk away with the top prize. But, like last year, those who do not win in the top 5 Oscar categories (Best Director, Best Actress, Best Actor, Best Supporting Actress and Best Supporting Actor) will still be given a gift – a donation of 10,000 meals to the animal rescue of their choice. 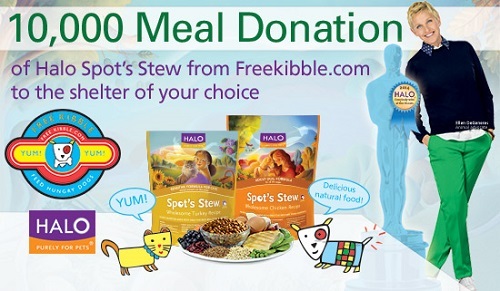 The donation is made possible by Ellen DeGeneres and her dog food company, Halo, Purely for Pets in partnership with Freekibble.com. The donations are part of a PR campaign called Everyone Wins at the Oscars® which is organized by a Los Angeles marketing firm specializing in product placement. (The Academy Awards has no affiliation with these gifts – called ‘swag bags.’). The bag contains many high-end gifts, a value of US$125,000! It’s been estimated that almost 150,000 stray dogs and cats make the city of Istanbul, Turkey their home. Now a company named Pugedon has designed a vending machine “A Smart Recycling Box” that dispenses dog food when an empty plastic bottle is inserted. The machine also has a water dish so people can empty out remaining water for the animals to drink. The idea is to support recycling and to help care for strays. Probably the most important aspect of the machine is that it raises awareness of homeless animals. Here’s the company’s promotional video on how the machine works.